Hi. We would like to introduce to you our very new: SoapLab’s Coconut Liquid Soap Base! This soap base is made using Coconut derivatives like: Cocoamidopropyl, and coconut oil. The function of this soap is exactly as the SoapLab’s Liquid Castile Soap; only this Liquid Soap is more clear (Castile is brown- dark brown: can get ugly), And its more PH balance (lesser eye sting) : therefore better for baby products. What to Do with SoapLab's Coconut Liquid Soap? How to use this liquid soap? How To Make A Recipe Using This Liquid Soap? 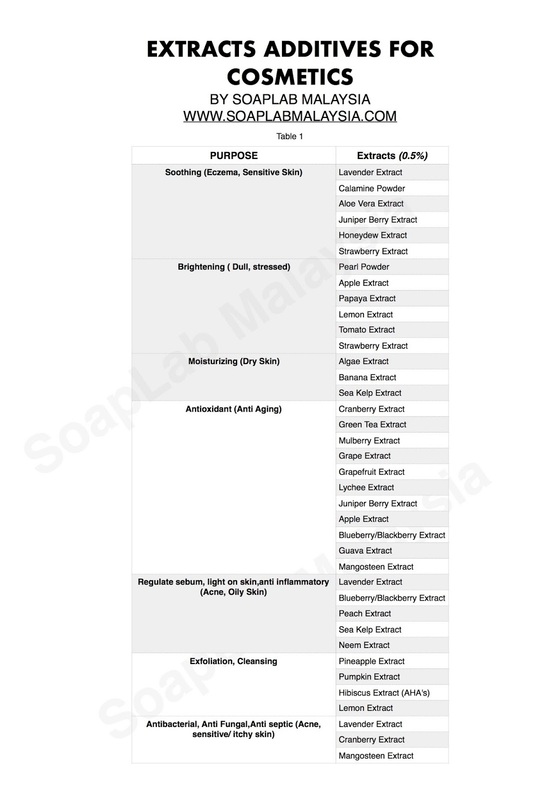 Here is a list of extracts SoapLab has and its function. Remember that this extracts 'dose' is only for extracts purchased from SoapLab. If you are getting your supplies from elsewhere always ask your supplier the suitable range. Some suppliers adds 'bulking agents' to the extracts therefore the potency of the extracts can get lesser and you will need to use more. in SoapLab we advice you to use maximum of 0.5% of extracts in your final product.